MS series compost spreaders from Tebbe are now stocked in Australia by Break It Down Composting , offering a range of benefits over larger style machines. 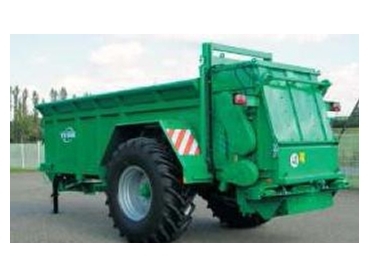 They feature a low centre of gravity, low loading height and high spreading capacity, and are especially effective at accurately spreading very low rates of product. A high throughput and solid shredding performance is insured by the inclusion of aggressive shredder beaters, which utilise easily replaceable, bolted, alloyed and hardened wear tips. The spreading table on these compost spreaders is protected by bolt on wear plates, which can also be easily replaced. Spreading discs are powered by 50mm shafts, with free-wheel protection in the driveline. Due to their narrow style body, MS series compost spreaders can accurately spread materials such as bone meal at a rate as low as 1.5 tonnes/hectare, and can be operated with approximately 9 HP per metre square of load. They can also be fitted with 710 / 70 R 42 wheels where appropriate.